~ These machines are fitted with a 13 or 16 amp plug & are supplied with appropriate installation hardware. 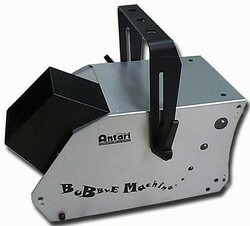 A stylish bubble machine which will produce hundreds of bubbles per minute. Spout design eliminates dripping as unused fluid runs back into the fluid tank, easy access fluid tank for quick refills. 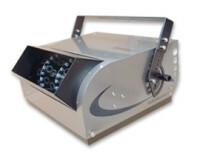 A large triple wheel bubble machine with the ability to provide approximately thousands of bubbles per minute. Spout design eliminates dripping as unused fluid runs back into the fluid tank, easy access fluid tank for quick refills. A huge four double wheel bubble machine which generate & massive, continuous torrent of bubbles. The three fans at the back of the unit spread the bubbles of a wide area, the machine features a large fluid tank & the front spout design eliminates dripping as unused fluid runs back into the fluid tank, easy access fluid tank for quick refills. Designed with large clubs & theatrical productions in mind this machine has on board DMX allowing for precise control over the bubble generation. 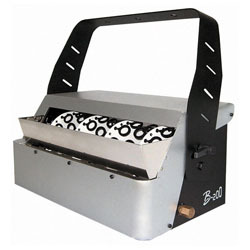 The machine is supplied with a basic on & off remote control. This is a medium sized foam machine with a continuous output giving about 25 cubic meters of foam from its 5 liter fluid tank. 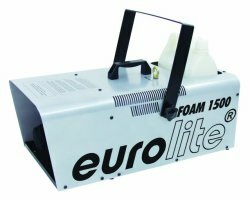 This is a great machine for parties & many other events, the foam will dissolve after a few hours.